Coke oven with 6 t cupola and two 1t high-frequency induction furnaces, and 4 molding lines. Using this equipment, we support high-diversity/low-volume production of small to large products, and manufacture numerous important safety-related parts such as brake parts for automobiles, and various types of hydraulic valves. Equipped with a double-squeeze type KDM molding line, large static pressure ACE molding line, and (in 2016) the latest small, flaskless static pressure FCMX molding line. We can provide products made of all sorts of materials, including FC, FCD, and FCV, for mass produced items ranging from a few kg to 200 kg, and we manufacture numerous items such as control valves and other hydraulic valve products which present the highest degree of difficulty in the industry. This plant also has a machining shop, and we can provide one-stop service for everything from materials to finished, machined products. ※This size is only for reference purposes. Using the latest machine tools, we carry out machining of hydraulic parts for construction equipment requiring ultra-high precision, and machining/assembly of automotive brake parts and other products. We can respond to a wide range of needs beyond just cast iron, including machining of aluminum forged products and similar items, and form machining using CAD/CAM. 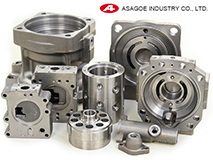 if you are looking for a supplier of iron castings for hydraulic valve parts or automotive parts, be sure to consult with our company. We boast one of the top track records in Western Japan. We respond to a diverse range of customer needs, from high-quality castings using various materials, to precision machining.